Generation X is lost generation of musician present Y generation known as incredibly sophisticated, much more racially and ethnically diverce into music interpretations. 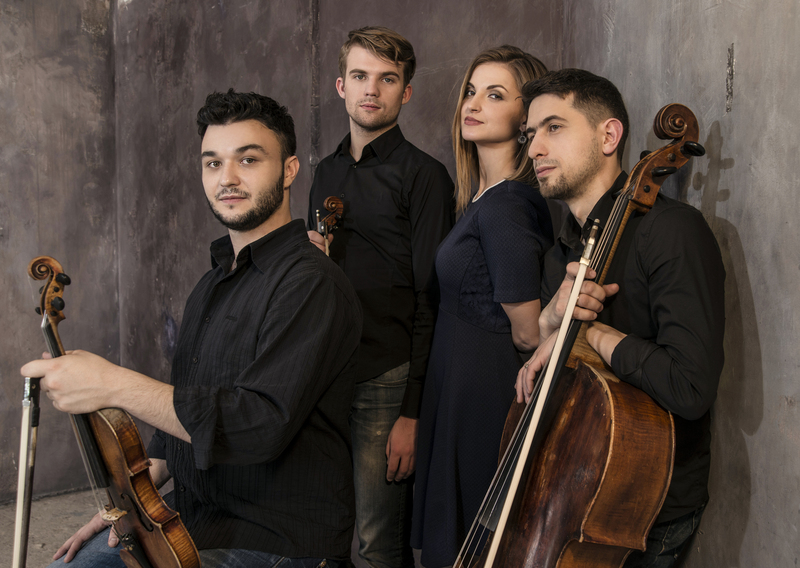 FBB are from Generation X will present Klever Quartet from new Generation Y. Klever Quartet was founded in 2013 by the group of young musicians, individually winners of many competitions, showing to the public all the brilliance of their personalities. In its still short existence, the Klever Quartet had to be noted in more than 50 cities in Russia and abroad, gathering full concert halls and excellent reviews. This truly international ensemble consisting of an Ossetian, Russian / Polish, Belarusian, Georgian and Circassian who play together with love and passion without nationalistic or religious borders. One of the unique features of the ensemble that the group has been working closely with a wonderful young composer and pianist, People's Artist of the Republic of Kabardino-Balkaria Murat Kabardokov. The result of their collaboration was the first CD "Without Words" for string quartet and piano that consists of original music of Murat, composed in styles of cinematic music and classical crossover. The presentation of the album was successfully held in the Small St. Petersburg Philharmonic Hall and the Moscow International House of Music. This truly international ensemble consisting of an Ossetian, Russian / Polish, Belarusian, Georgian and Circassian who play together with love and passion without nationalistic or religious borders. New Film "Francofnia" by A. Sokurov (Russian Ark) will be shown in Houston on 22-24 April. The music for the film was written by Murat Kabardokov, who will perform in a concert with the Klever quartet. The concert program will include works by the composer himself. We invite you to the discussion with the performers after the show. This year the group decided to participate several chamber music competitions. As a part of their preparation for the competitions in April of 2016 Klever Quartet is invited to the USA to be part of the Leopold Auer Society project "Music for World Peace". Both of these groups perform out of a love for traditional music and classical elegance. Join us for an innovative and exciting performance. The City of Austin’s Cultural Arts Division, a grant from the Texas Commission on the Arts, and an award from the National Endowment for the Arts, all have helped make this event possible. Please join us! Unity Church of The Hills 9905 Anderson Mill Rd.